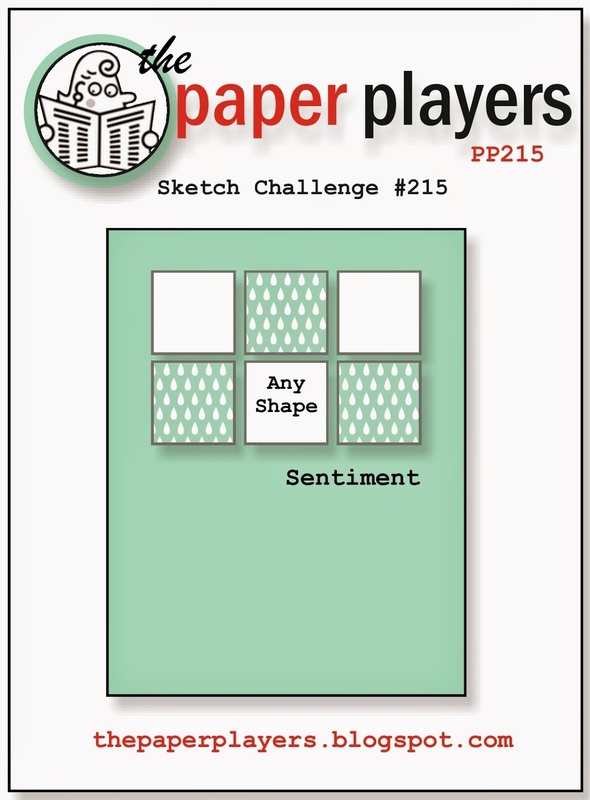 Paper Players was the first challenge I ever entered and it is the one I have entered most often. (This is my fifth one.) I like it because the challenges are varied and interesting within the rotation, so you know what type of challenge to expect. What I like the most is that the design team examples are so lovely and because lots of people enter, it's fun to look at so many different takes on the same task. Love it! I have entered so many challenges in the last six weeks because of my enforced convalescence but now I'm back at work, that will end. But this week, I was saved by the school holidays, so no work, which gave me time to have a look and a play. Sahara Sand and Cherry Cobbler is not a combination I've used before but I'm enjoying using strong colours at the moment and Cherry Cobbler is a divine colour, almost like rich velvet. The six flowers are popped up on dimensionals, as is the white layer and the tag. The white layer has had the edges distressed with Sahara Sand. 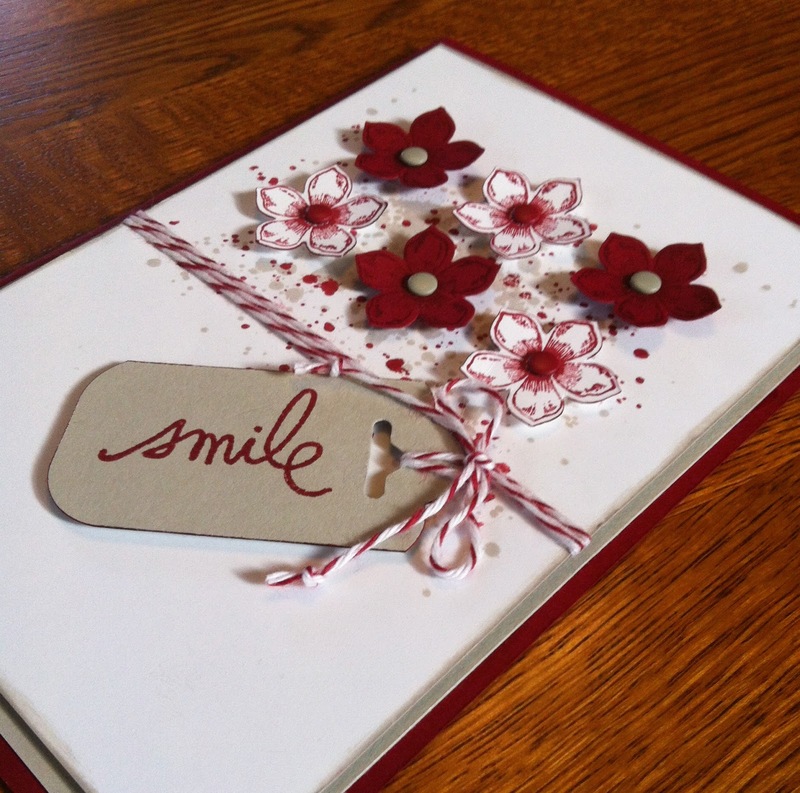 The tag and white flowers are edged with a Cherry Cobbler marker to give them extra definition. 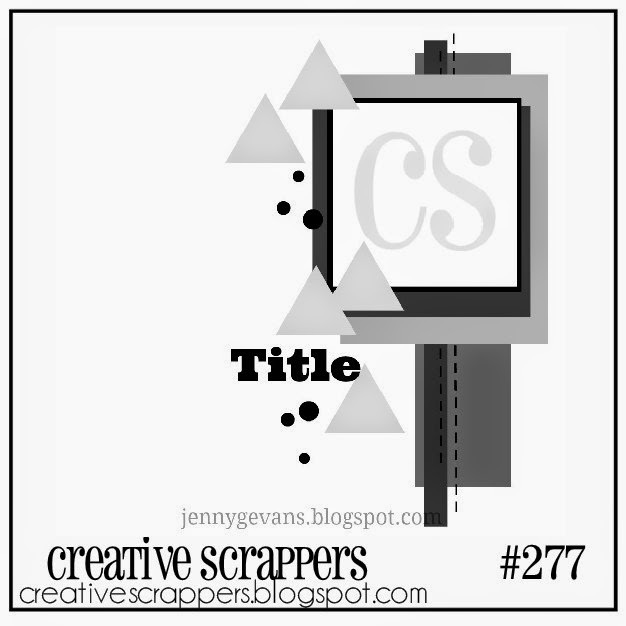 I made the tag with the scallop tag topper punch but with a piece only 2.5cm wide. Other: Scalloped tag topper punch, Petite Petals punch, Regals and Neutrals candy dots, Cherry Cobbler baker's twine, dimensionals. Very recently, I started following the blog of Narelle Farrugia after seeing some of her work on-line and really liking her style. Through that, I discovered the wonderful Just Add Ink blog, just in time for a new sketch to appear. So, I thought I'd give it a go since the sketch really appealed to me. And here is my version. I especially like the strong colours (white, Lost Lagoon and Blackberry Bliss) and the symmetry of the design, which is restful and harmonious. I also like the way the circles that dominate the centre of the banner morph into straighter lines as you move out from the centre of the card, via the banner edges, the lattice embossing and the hexagons of the DSP. The coloured circles are popped up from the body of the white banner by dimensionals and then each central circles is popped up again, giving a pleasing impression of depth. Update: I was delighted when this card received an Honourable Mention at Just Add Ink. Stamps: SU Eastern Blooms, Hero Arts Thank You set. 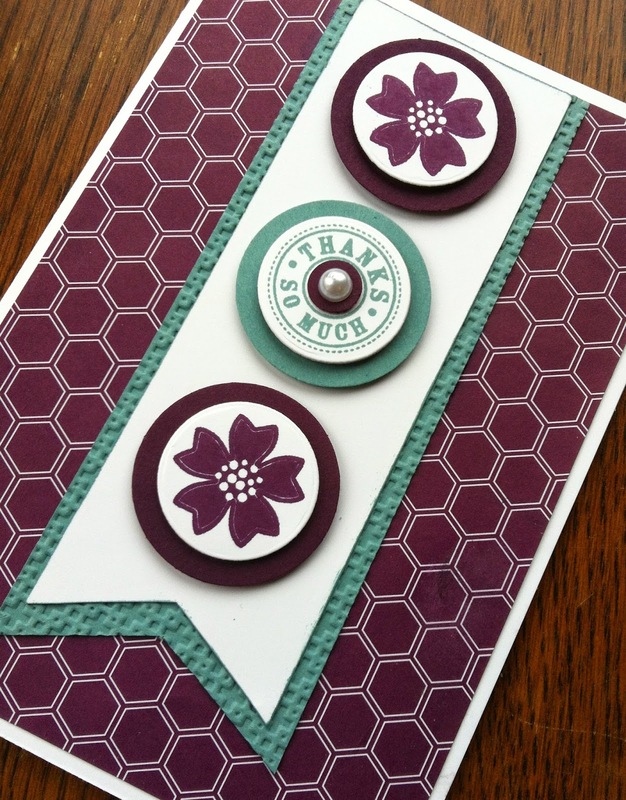 Other: Square Lattice embossing folder, dimensionals, circle framelits, itty-bitty circle punch, pearl. This week's challenge from Pals Paper Arts was a lovely sketch and seemed a good chance to use my new(ish) stamp set, Kinda Eclectic. I really like this stamp set and my favourite part of it is the leaf stamp, which I've used on the cardstock to make a background. The edge of the cardstock is sponged in Sahara Sand and the leaves stamped in Blackberry Bliss and Mossy Meadow but stamped in third and fourth generations to tone down the strength of the colour. 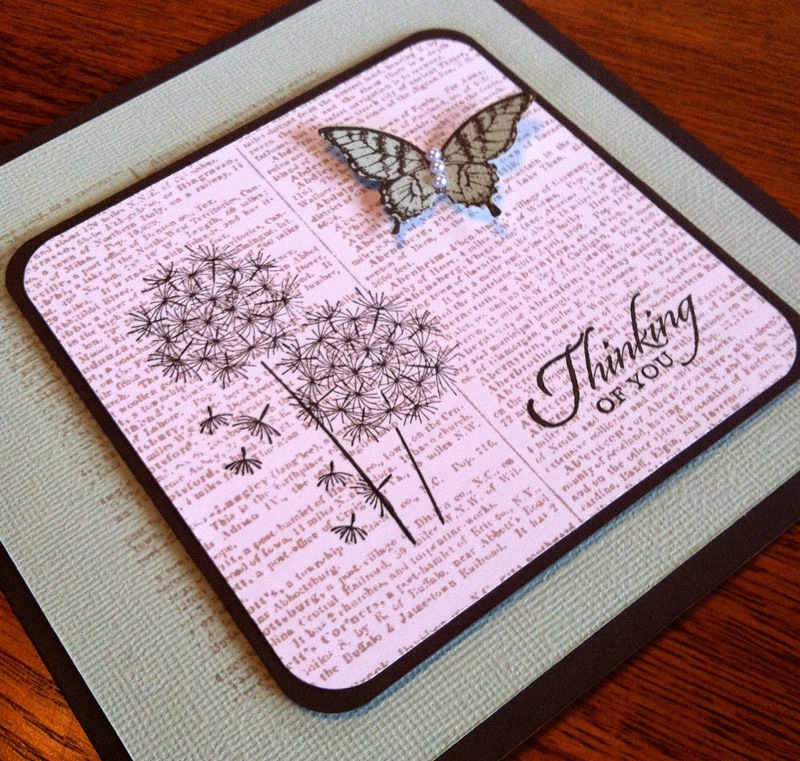 I've used the Dictionary background stamp in Sahara Sand on the four tiles and used other elements from Kinda Eclectic in Hello Honey, Mossy Meadow and Soft Suede, while the butterfly from the same set is in full-strength Blackberry Bliss. The edges of the tiles have been lightly sponged in Sahara Sand to give more definition. The whole tile section is mounted on Sahara Sand then Soft Suede. I originally stamped the sentiment on a banner shape and sponged around the edges but it was just too busy, so I abandoned that idea and stamped in Soft Suede directly on to the Sahara Sand. The central panel and butterfly are popped up on dimensionals. It's a much busier card than I usually gravitate towards but I like the exuberance of it, in this particular case. Two challenges caught my eye this week. Freshly Made Sketches 155 was a lovely drawing while Connie and Mary 322 had an unusual colour challenge. Update: This card received an Honourable Mention at Freshly Made Sketches. This week's Less is More challenge 190 was one I really wanted to do: "Face the music and dance" because I have a son at university studying music. I like to have a stash of music-related cards to have on hand for him: special occasions or 'just because' and it's the latter that this one falls into. 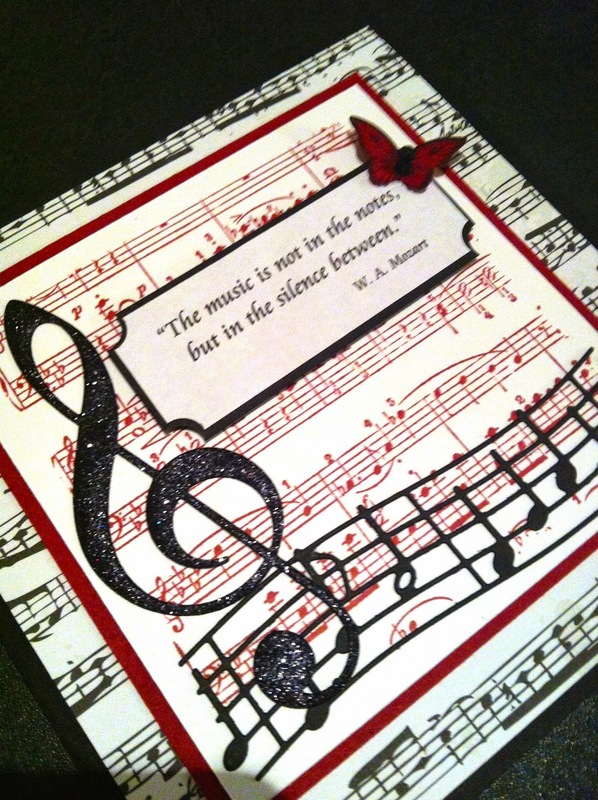 Other: Virtuoso music die, Glitter music sticker from stash, small circle punch from itty bitty punches to shape the corner of the sentiment, Butterfly punch, dimensionals, Mozart quote found and printed using Word, black rhinestones. I've never entered a challenge with Connie and Mary before, but this week's sketch intrigued my mathematical side. 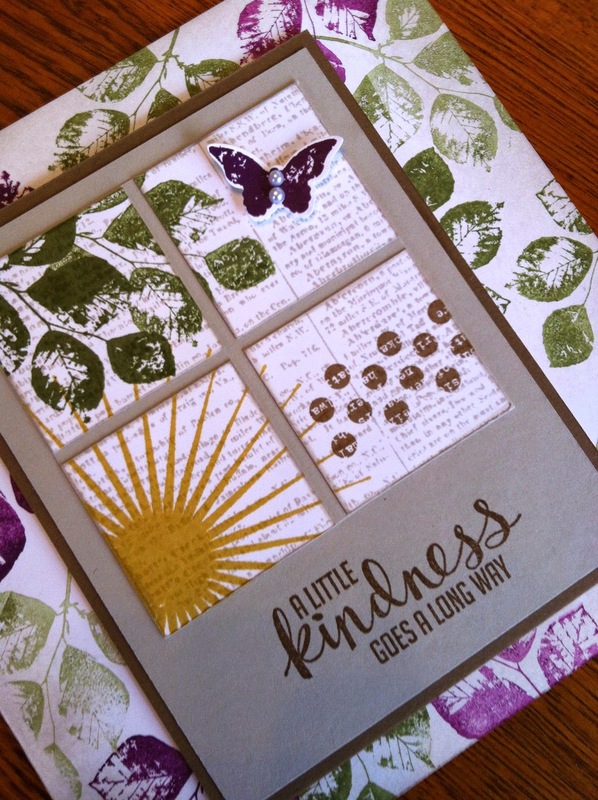 I also liked the challenge of using only Stampin' Up products. Here it is. The mathematical part of me decided to create the diagonals by cutting the top layer into pieces and raising them on dimensionals to form gutters that showed the DSP layer underneath. 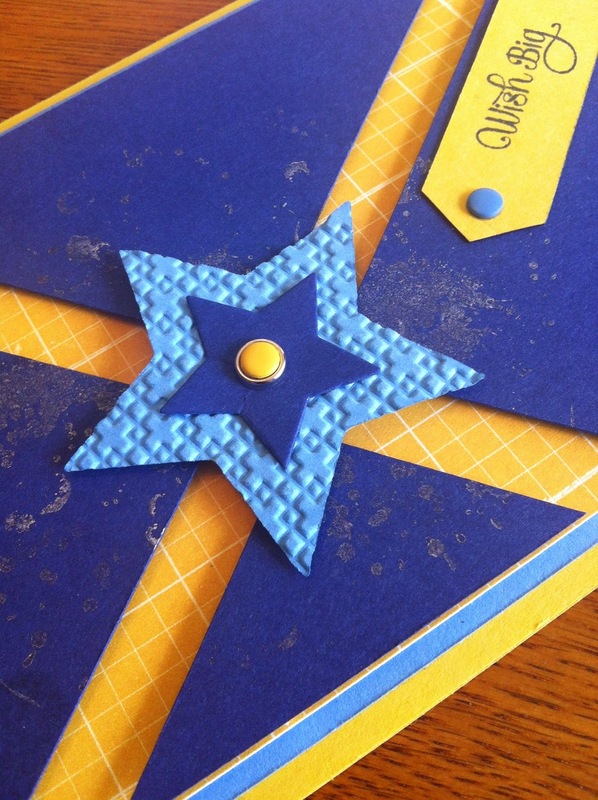 One layer of the star was embossed using the Square Lattice folder. To create a bit of 'splash' for the star, I used a stamp from Gorgeous Grunge and Illuminate ink. 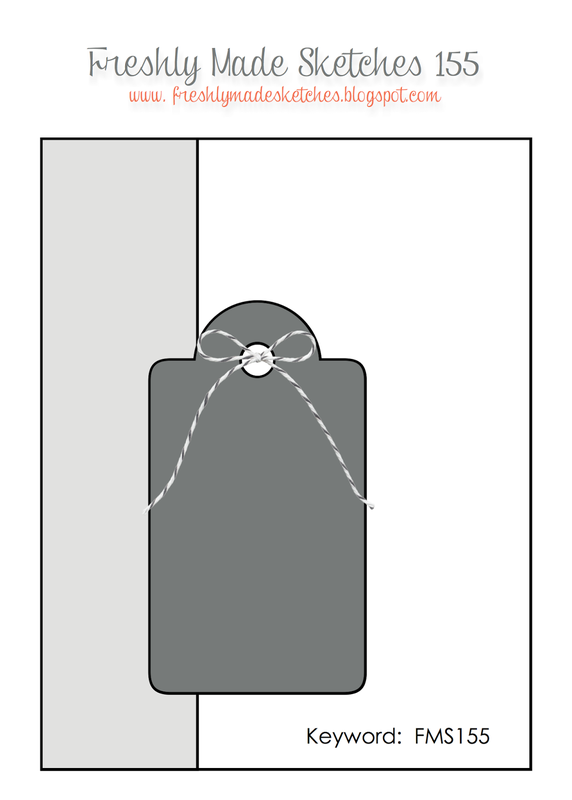 The ends of the greeting strip are cut to echo the shapes created at the corners of the diagonals. My aim was to create a masculine card and I think that's been achieved. Paper: Hello Honey, Night of Navy, Marina Mist, Moonlight DSP stack. Other: Candy Dot Brad base, Candy dots (Crushed Curry, Marina Mist), Star Framelits, Dimensionals, Square Lattice embossing folder. This week's Pals Paper Arts challenge was a colour challenge, which was truly challenging for me since they were colours I don't often use. I enjoyed it in the end and felt happy with the card - might even use the colour combo again. The coffee stamp is a HastingsArt stamp from my local scrapbooking shop. I stamped the cup in Stazon ink and coloured the dots in Always Artichoke then stamped the steam in Cajun Craze. 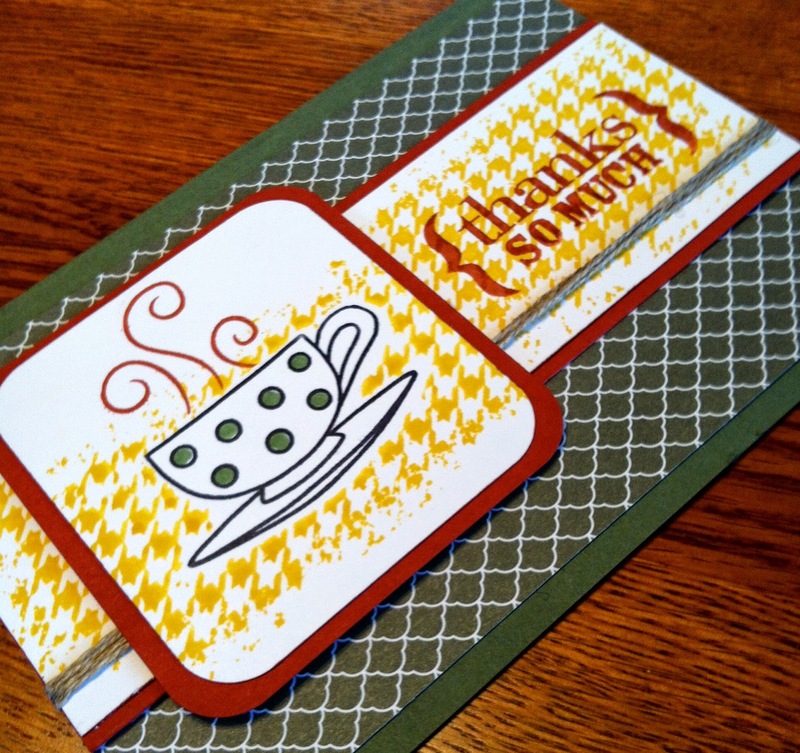 I masked the cup then stamped the distressed houndstooth background over it in Crushed Curry, then rounded the corners and mounted it on Cajun Craze. Stamps: HastingsArt Coffee Cup, CTMH Distressed Houndstooth background stamp, Hero Arts Thank You Stamp. Ink: Stazon, Crushed Curry, Cajun Craze. Other: Corner Rounder, Linen Twine. 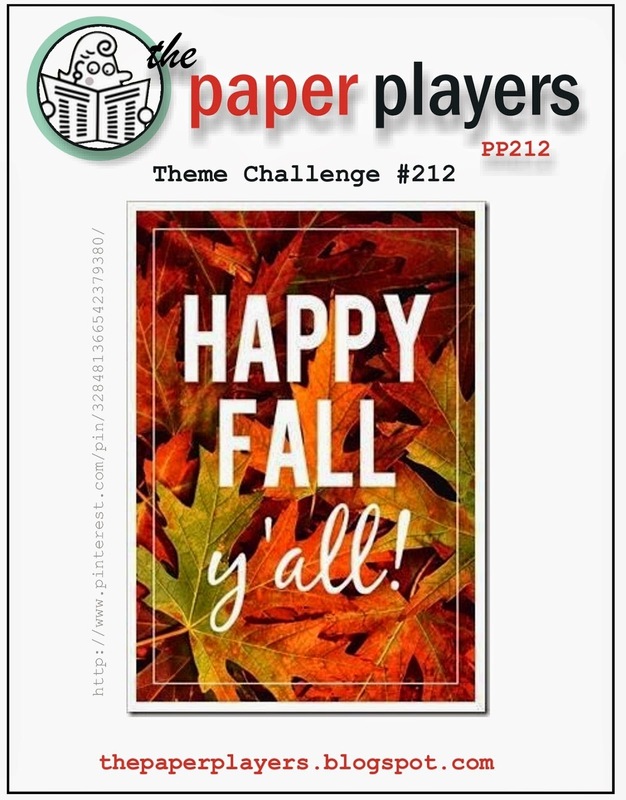 This week's Paper Players challenge was a fall card. In New Zealand, it's coming into spring but I'm never unhappy to have a reason to play with one of my favourite stamp sets, French Foliage. And autumn colours are so lovely, it's no hardship to play this week. Sweet and simple, one layer, here it is. Despite the clean and simple design, six inks plus gold embossing were used. The masked and sponged background moves from light to dark by moving from So Saffron to Cajun Craze to Tangelo Twist. The background rain drops are in Crumb Cake and the leaves in Cherry Cobbler and Early Espresso. The sentiment is a Hero Arts stamp, embossed in antique gold. I used Very Vanilla for the card base. These pictures have been on my desk for a few weeks now and while I had a few ideas about what to do with them, this week's Creative Scrappers sketch clarified the ideas somewhat. The colours were always in place: she is rarely seen in anything other than black with sometimes a hint of pink while jewellery is always silver. 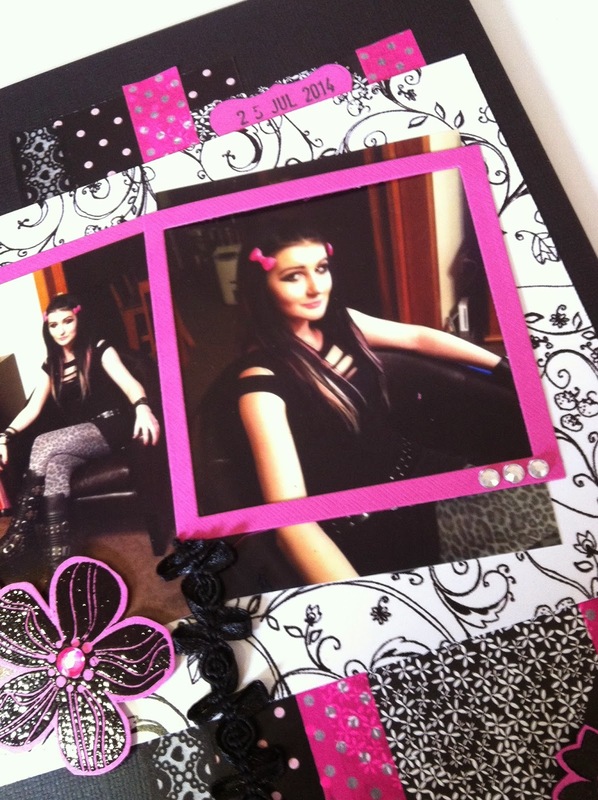 She manages to combine elegance and grunge at the same time and I was hoping for that in the page too. And here is my page based on it. Everything came from my stash, so some things I can no longer remember where they were from. 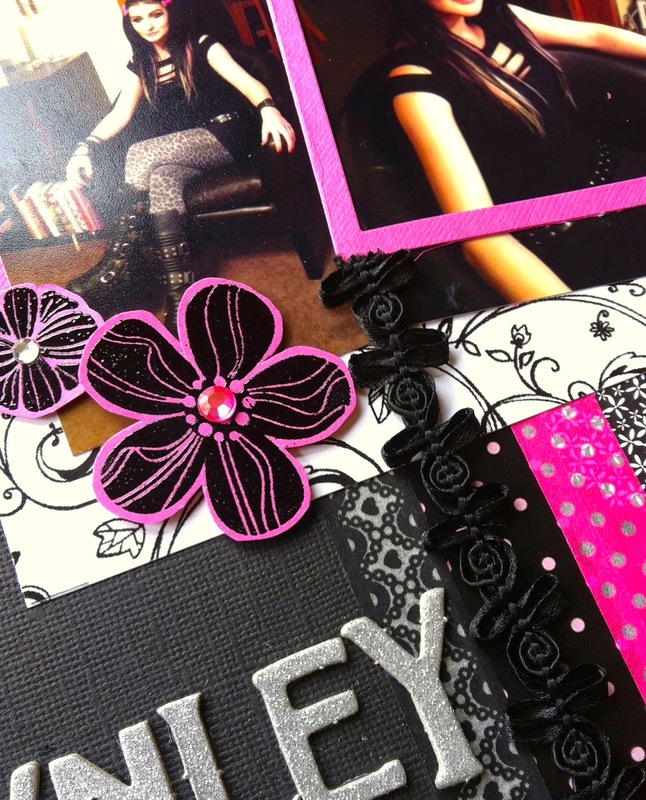 The pink and black flowers worked well: I embossed SU Eastern Blooms onto the Bubblegum Bazzill paper using black embossing powder then cut them. Paper: Bazzill black and bubblegum, Pavlova Papers Apple Scroll Black, Pavlova Papers Black Paris Pink Dot, Unknown paper with the white floral hearts - possibly a Bo Bunny design. Other: Washi tape from Typo, Pink washi from a Crazy Monday Kit, Ribbon scrap from the scrap box, Pebbles Jewel candy dots, rhinestones, Bella Glittered chipboard letters, silver inkpad, balck inkpad, square framelits, label punch. My ruptured Achilles has kept me off work and off my feet for some weeks now, hence the free time to trawl the Internet for interesting challenges and time to create new things. During this time, I've developed a bit of a love affair with Lost Lagoon, from this year's SU in-colours. 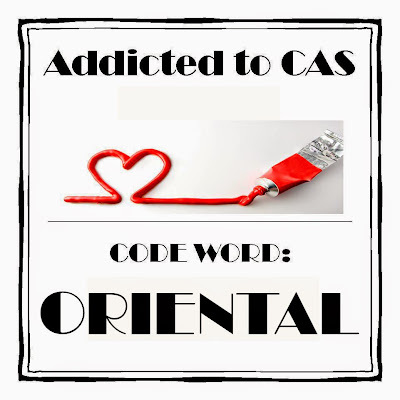 And I've found another great challenge blog, Addicted to CAS. They came together in this card. Recently, I bought second-hand SU Eastern Blooms which I have used in this card. The image is stamped in Mossy Meadow but I have replaced some of the cherry blossoms in the stamped image with cherry blossoms punched out with the Itty-Bitty punch in Lost Lagoon and Pool Party and filled them with small pearls. The sentiment, from SU Dozen Thoughts, is stamped in Mossy Meadow. The central panel is raised off the cardstock by dimensionals. 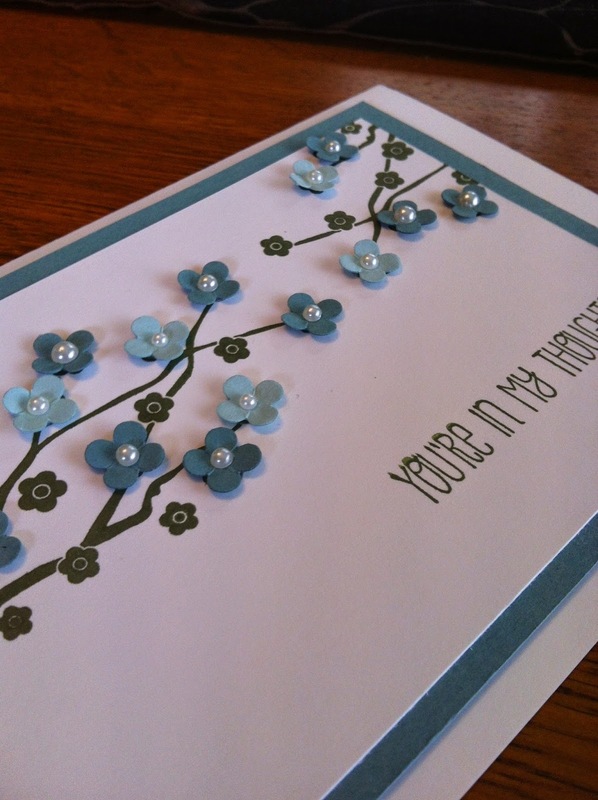 The wide border of white from the cardstock helps to create the serene feel of this card. It's funny how sometimes the card you make is exactly what you imagined and other times, they just develop a life of their own. A friend of mine is an author, who told me once that a character just showed up on the page and completely took over her book. He was meant to walk on and off but ended up staying and making the story his own. This card is a bit like that. It started with the "Less is More" challenge 188: to use the delicious combination of chocolate and mint as a colour inspiration and in my mind was a friendly "thank you" using my as-yet-unused coffee cup stamp but has ended up being a slightly melancholy sympathy card. It's a larger style card, 15cmx15cm. The colours are SU Early Espresso (dark chocolate), SU Crumb Cake (milk chocolate) and Kaisercraft Pistachio (mint aero chocolate) and white (maybe milky bar?). Stamps: SU Dictionary, SU Wetlands (for sentiment), SU Papillon Potpourri, Hero Arts Dandelion. Other: Corner rounder, dimensionals, small pearls. This card is a first for me. It's the first time I've ever made a card for more than a single challenge but these two just fitted together into an idea that actually turned out as I imagined it. Love it when that happens! The first was a sketch from Freshly Made Sketches and the second an exciting colour challenge from Pals Paper Arts. I really like this colour combination. I wanted to use my two new stamp sets, Dictionary background stamp and Kinda Eclectic. The Dictionary stamp in Crumb Cake is on the focal panel and also stamped off into the background layer. Because Blackberry Bliss is such a strong colour, I stamped in two generations to get a variation in tone. but used the colour full-strength for the sentiment. This sentiment stamp came in a second hand Stampin' Up set I bought but I don't think it is actually part of the Eastern Blooms set, so I'm not sure where it's from. Although it hasn't photographed so well, the Papillon Potpourri butterfly with slightly raised wings is sitting on a flat Hello Honey butterfly and this gives a nice sense of movement. The strip is a layer of Crumb Cake then Hello Honey and finished with Blackberry Bliss ribbon. Other: Butterfly punch, corner rounder, Blackberry Bliss ribbon, dimensionals to raise the panel and top layer butterfly. Another discovery of my convalescence was Mojo Monday and this week there was a lovely sketch to work with. Last night, I got an order from my Stampin' Up demonstrator - another side effect of being housebound is endless opportunity to peruse the catalogue - and among my order was the Wetlands stamp set. I am having something of a love affair with Lost Lagoon at the moment and these two things lead to the card I made, which played the sketch pretty much as is. In recent weeks, I have been experimenting with sponged backgrounds but this is the first real sea scene: Sahara Sand in the foreground and Lost Lagoon at the top. How to make it look a bit more like the sea? I used one of the stamps from Gorgeous Grunge and Illuminate ink to give some ripples then freehanded using a silver gel pen to give some more definition and movement. Perhaps need to invest in a white gel pen for the future, although the silver gave a more subtle effect, that I was happy with. 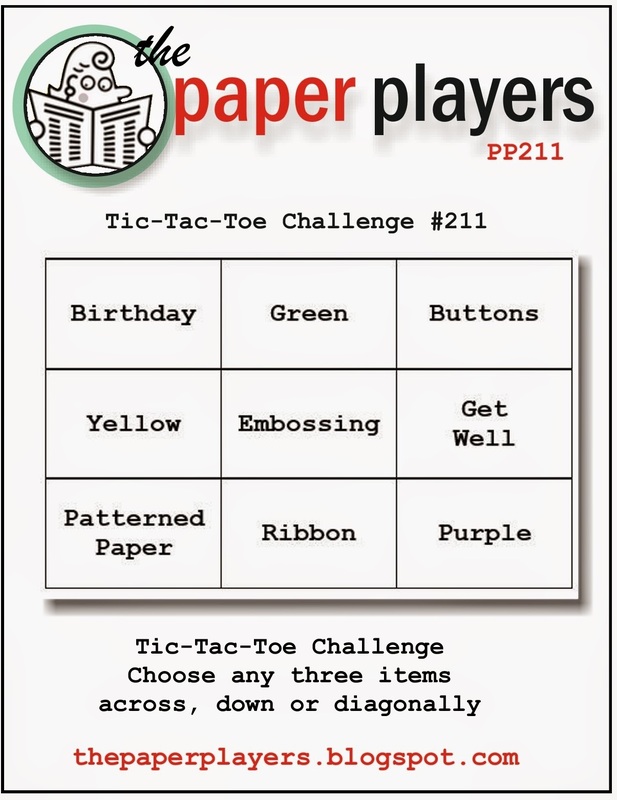 I thought that this week's Paper Player's challenge was exciting: a tic-tac-toe board to choose a line from for a design. Quite a lot of time went into choosing! 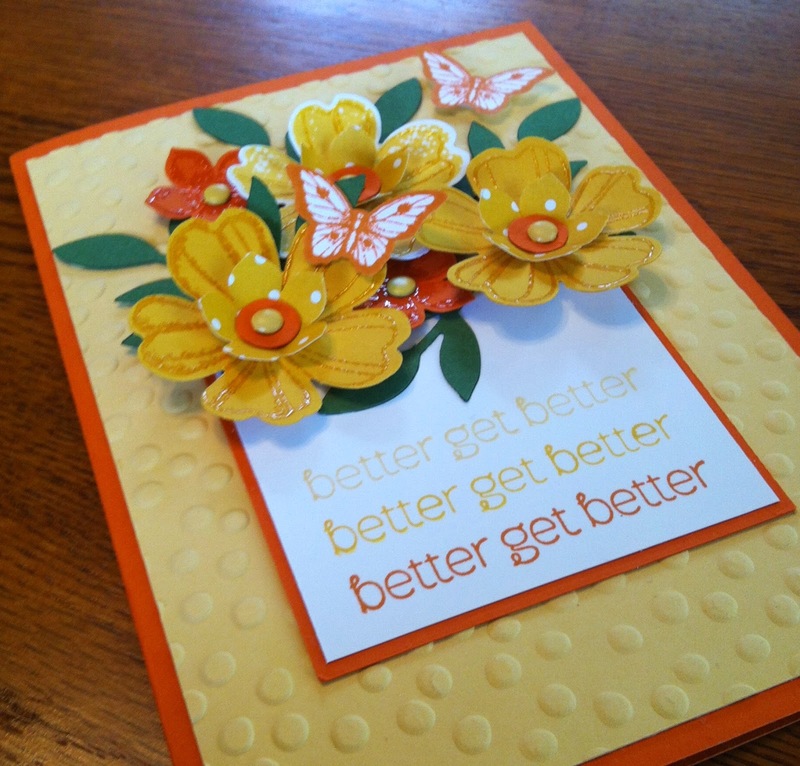 I went for the middle row: yellow, embossing, get well card. When you're not well, you want to feel cheered up so I went for Tangerine Twist to use as an accent with yellow. Coming into spring, flowers seemed a good option too. The flowers pop off the card to give a 3D effect and I liked the grading of colours from So Saffron to Crushed Curry to Tangelo Twist on the sentiment. Papers: Whisper White, Tangelo Twist, So Saffron, Crushed Curry, Garden Green and scraps of Crushed Curry DSP. Other: Decorative Dots embossing folder, Clear embossing powder for the flowers, Leaf sizzlit, Flower Shop punch, Petite Petals punch, Itty Bitty circle punch, Subtles brads and Candy dots, dimensionals. Pals Paper Arts is another new challenge that I have discovered during my enforced time off work. This week, there was a lovely sketch challenge. What came to me was a vision of sumptuousness and hints of royalty, perhaps a mother's day card or a special female birthday. But never has the moonboot, crutches and no-driving been so annoying because it meant I could only rely, once again, on my stash. And I really wanted some gold foil paper to match my antique gold embossing powder! None the less, I'm still happy with the result. I used So Saffron card, So Saffron ink and the Baroque embossing folder to create the background paper and I think it does have the opulent look I was hoping for. Elegant Eggplant, despite the oxymoronic name, is a rich, lush colour that conjours visions of kings and queens so suited my idea well. The main image, which is the adorable Beautifully Baroque stamp from Stampin' Up, looks superb embossed in gold. I did an alternative version with parts of the image coloured in elegant eggplant but decided it really looked better as it was. 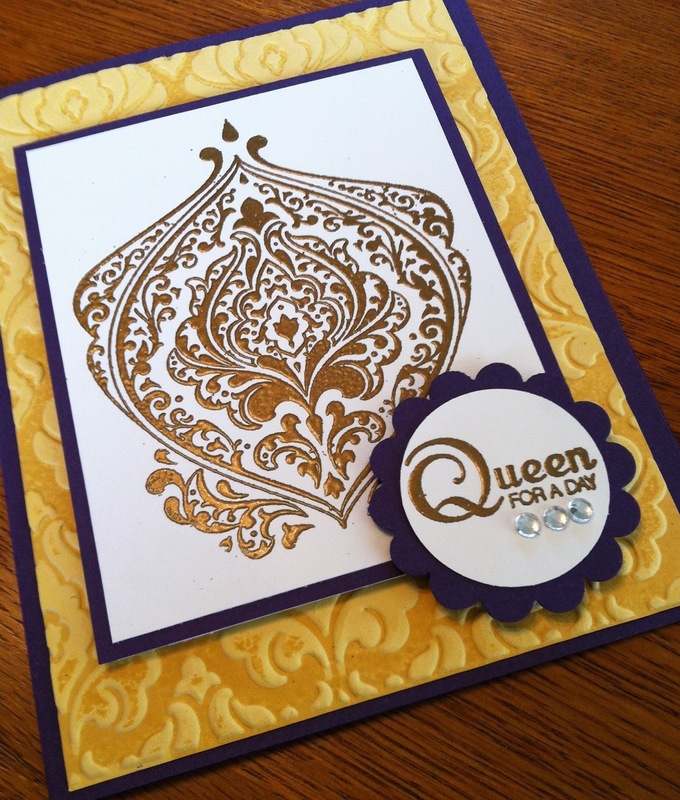 'Queen for a Day,' also embossed in gold, finishes off the vision, along with three rhinestones.